Size: 12 1/2" in diameter. Materials: Shiny quality crochet cotton n° 30, about 170 yds eacha white (W) and pink (P), small amount each red (R) and green (G). Steel crochet hook US size 11 or Size for gauge. Six yellow rocaille beads. Gauge: Rnd 1-5 of Motif A = a 3/8" in diameter. 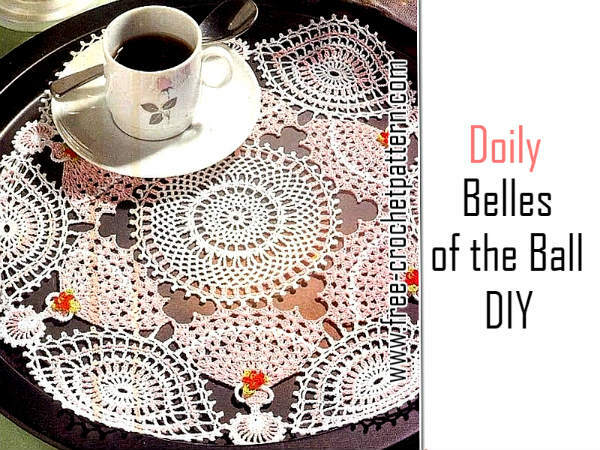 If yo use shiny crochet cotton n° 5 and steel crochet hook US size 1, mat will measure about 27 1/2" in diameter. 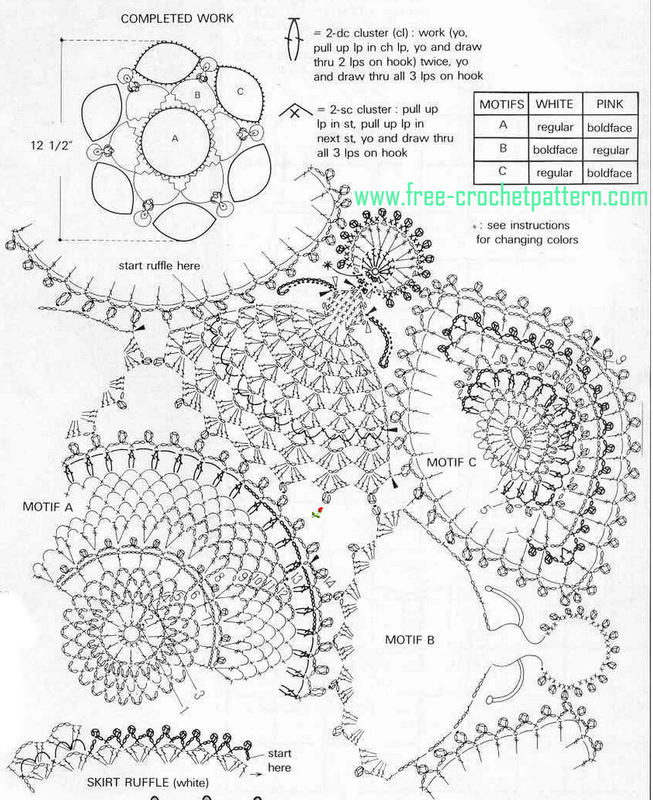 Motif A: Form loop with end of W.
Round 1: Ch 1, in lp work 12 sc; close with sl st in first sc. Round 2-14: Work following pat diagram and color key. First dc= 3 ch and first tr= 4 ch. On rounds 3-5 and 8-11, last 2 ch sts=1 hdc worked in ch-1 (in top of ch-4 on rond 8). Close all other rounds with sl st. Work cluster symbol. On round 14, picoted ch lps= 6 ch, 1 sl st in 2nd st of ch-6, 2 ch: close with sl st in ch-1 fasten off (see black wedge). Beg at Head, form loop with end of W.
Round 1: ch 1, in lp work 1 sc, 2 hdc, 7 dc, 2 hdc and 3 sc; close with sl st in first sc. Pick up P, pull up 1p thru last W lp, drop W to WS. Round 2: with P ch1, work 1 hdc in next st, then (1 ch, 1 dc in next st) twice, 1 ch, 1 hdc in next st, 1 ch, 1 sl st in each of next 2 sts, extend lasta lp, drop P and 1p. Insert hook in next P st, pick up W, pull up lp with W.
Round 3: work sc and picots as shown end with 1 sl st over last P ch st, pic up dropped P lp (=2 lps on hook), yo with W and draw thru 2 lpson hook. Drop P on WS and cont NECK with W: 1 ch, 1 sc in each of next 2 W sts, 1 sl st in next st; ch 1, turn, work 1 sc in each of last 2 sc. Cut white (white wedge). Holding neck up and RS facing, insert hook in sc of neck, pick up P, ch 1, work 2 sc of neck, ch 1, turn. NEXT ROWS: finish body and skirt followinf pat diagram and 2-sc cluster symbol, on last row fo skirt join at 3 picots with sl st to corresp p on round 14 of Motif A. As of second Motif B, join also to adjancen Motif B as shown. At en of last skirt row, fasten off (see black wedge). Last, complete arms and fuffle following respective diagrams. Round 1: ch 1, work (4 sc, 3 ch, 4 sc) 2 times; close with sl st throughout. Rounds 2-9: work following diagram and 2 -dc cl symbol. First sc= 1 ch throughout. On round 9 join at picots to adjancen Motifs A with sl st, sc and dc; close with sl st in ch-1. Fasten of (black wedge). Complete leaves and florwers following respective diagrams, sew to hands as shown with bead in center.